Everybody and everything for your convenience and comfort. Due to its great tradition in Monclova, its facilities and conveniencie of a Grand Turismo hotel, and the ideal characteristics for a business center, Hotel Chulavista has consolidated as a favorite not only for business travelers, but also for families looking for a relaxing day. 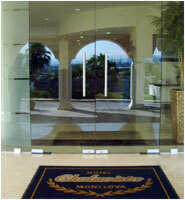 With more than 45 year of experience, Hotel Chulavista is also a company of Grupo Industrial Monclova. For us is very important that your staying in our hotel be delightful. If you find anything wrong during your visit, please tell so to our manager and we will be glad to solve it.